NOTE: CRP play mode is no longer being actively developed and is provided as is. The following mods support CRP play mode: Pathfinder, DSEV, MOLE, Heisenberg. 1. Install Pathfinder and other desired Wild Blue mods. 3. At the Space Center, press the WBI button. 4. Press the Pristine play mode button. Press OK button. 6. At the Space Center, press the WBI button. 7. Press the CRP play mode button. Press OK button. After planting the flag, taking the group photo op and getting a good night's rest, Bill got to the real work of the Duna One Expedition's post-landing ops: building the Pathfinder base. Grabbing a powered screwdriver and a Saddle from the Buckboard 2000, Bill detached the Ponderosa from the cargo lander and bolted the Saddle into the surveyed ground. He then attached the Ponderosa module to the Saddle. "Get the Doc next," Bob encouraged Bill. As the engineer walked over to the Buckboard, Val and Jeb hooked up the Saddle to the cargo lander's equipment storage tank. Bill supervised the Ponderosa's assembly, while Bob outfitted the module as a Pathfinder geology lab. Once the engineer attached the Doc Science Lab to the back of the Ponderosa, Bob immediately got to work again. "Uh oh," Val said. "The Sombrero didn't survive the drop. The solar panels are broken. Can you fix it, Bill?" Bill looked at the solar array and shook his head. "No, but I can rig up a generator from one of the Buckboards, and use the Gold Diggers to dig up some ore."
"But, I need those drills to take core samples," Bob protested. "Without those core samples we can't tweak production efficiency!" "Don't worry," Bill responded, "we can convert the spare Casa into a workshop and print some more using the material kits in the lander." "Ok, let's get that done after we set up the Telegraph. We need more relays back to Kerbin." You've done your flags and footprints, now comes the time to do some geology to find the best place to plunk down your more permanent base. Establish a basecamp, stay awhile, and survey the land to see if you can find a better concentration of resources (or perhaps a worse concentration, maybe those orbital scans weren't accurate). If you've found the right spot, then it's time to bring in the bigger stuff. If not, then it's time to pack up your Buffalo Modular Space Exploration Vehicle and look elsewhere. Pathfinders have KIS/KAS friendly, portable equipment to go “space camping" with. Just convert a few Buckboard or Conestoga multipurpose containers into storage units, pack your gear, and head out. Want to build a sprawling temporary base? 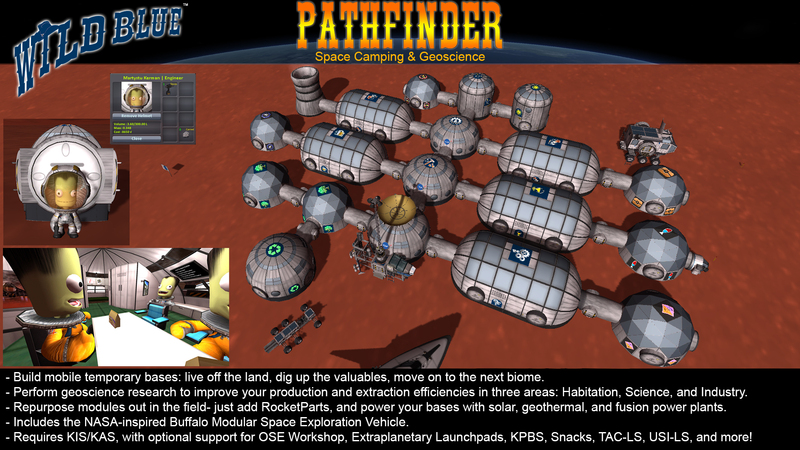 Pathfinder offers a number of different parts for temporary base building, with optional support for mods like OSE Workshop, Extraplanetary Launchpads, TAC Life Support, Snacks, USI-LS, kOS, and more. Pathfinders are always on the go, and you can travel in style with the Buffalo Modular Space Exploration Vehicle (MSEV), based on NASA's real-world MMSEV. Whether driving or making sub-orbital hops, the Buffalo has you covered. As if that's not enough, you also have a personal flying wing known as the JetWing, and the Outback EVA Support System, which can hold a small amount of a lot of different resources. Don't like how the mod is configured? Simply press <mod key, which defaults to Alt on Windows> and P simultaneously to bring up the Pathfinder Settings window. It's not cheating if the default configuration for the mod simply doesn't match your play style. Additionally, Pathfinder is easily customizable using ModuleManager patches. Want to create a new template? Here's a wiki page on how. Requires Kerbal Inventory System (KIS) and Kerbal Attachment System (KAS) by KospY & Winn78. Featured on Kottabos Space Program, here is an early look at Pathfinder. Thanks Kottabos! First, and cool! Does it support Roverdude's Life support mod, though? Can't remember the name. Not at present, no. There are three difficulty levels for life support: none, Snacks, and TAC-LS. If there's a lot of demand for it then I'll consider adding it in, but Snacks covers the mid-range difficulty, and TAC-LS provides the challenging difficulty. Also, please remember that this is beta, there are bound to be bugs. I do plan on adding more stuff to the base, camping gear, and Buffalo, including IVAs for the base modules. Excellent, glad to see it in the release section! Great stuff here. Honestly, I think I'm gonna delete the base segments for now. Until the IVAs are ready. Still this shows so much promise. The buffalo's IVA, there's a masterpiece. Good job! I think that Mr. Weir would approve. //This MM patch configures Pathfinder's life support systems to use USILifeSupport. cropYield = 389 //You'll have about a year's worth of Snacks for one kerbal. description = This kit stores Oxygen, Food, and Water for your life support needs. Thanks! If you're familiar with GitHub, you might make a pull request to so that Angel-125 can include it in the next release (and if you're not, I'm happy to do so for you). EDIT: I'm also really interested to know how this compares with UKS! Thanks! I'm glad you like the mod. Thanks. USI-LS doesn't fit my vision for the mod. But Pathfinder gives you options to match your play style. So when people ask about USI-LS, they'll be able to locate your patch files. Hm. Well, the Buffalo is integral to Pathfinder (and will work nicely with DSEV Phase 2), and fits the mod's theme of being on the go, prospecting for good resources, improving extraction rates on drills, that sort of thing. The downside for me is having to support a whole bunch of different mods, and that becomes a chore. But I anticipated that people might want to use the Buffalo separately, so if you look in the Assets folder, you'll find the Buffalo in its own separate directory. The only thing you'll need is the WildBlueTools directory, which contains the plugin used by the MSEV as well as its common storage templates. You'll also need Community Resource Pack for its community resource definitions. Next release I'll look into making it more separable for those who just want the MSEV. This is excellent. 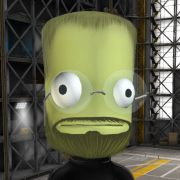 Might I submit my own humble request for support of USI Life Support (http://forum.kerbalspaceprogram.com/threads/116790-1-0-USI-Life-Support-ALPHA-0-1-0-2015-04-27). Mainly because my career save is intricately tied into that system, however, I don't have alot of ground bases yet and soon hope to expand. Great mod! I'm building a proving ground at kerbin north pole to test out some base designs. oh please change the name! it bleeds mah eyes!!! Awesome! If you take a screenshot and are willing to allow me to put it in the showcase album, I'll be happy to credit your work. Oh that's right, Sarbian is now maintaining MM. Good catch, thanks for pointing that out. Sure! I'll take screenshots as I build and make an album you can pick and choose from. May have a bug, was present pre .8, and not sure if it's the intended behavior. In the science lab, if you transmit for Reputation or Funds it seems to require a ton of time and power. If you transmit for science it works as expected. Also it seems if you transmit for Funds or Reputation your stored Data goes to 0. If you transmit for Science your data stays intact. If you switch away from the craft while trying to transmit it sets stored Data to 0. Thanks for the feedback. I'm away for the weekend, so it'll be next week to release some bug fixes. Having just finished The Martian a few days ago... very cool! I'll have to check availability through CKAN. He was quite courteous when he replied to me about this. That being the case, I'd be interested and willing to package up these as supplemental mods, so that by installing it, both USI-LS and Pathfinder would be installed. I've already done this for KW-Rocketry, and would accepts patches/changes on Github as requested. So, @ Badsector, would this be ok with you?